Acc Art Books, 9781851498574, 452pp. - An exciting adventure from a debut novelist.- Seamlessly blends fantasy and science fiction.- Lavishly illustrated with many full color plates and original drawings by the internationally famous artist, Julie Bell. The wee-folk have returned. But we are surprised to learn they are called vinetropes, not fairies. Uncover the mystery of who vinetropes are and why they have returned in this first book in The Vinetrope Adventures series. 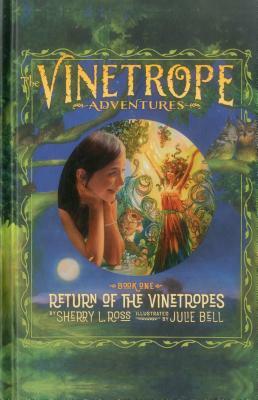 Following a young girl, Sara, who has recently lost her mom to cancer, Return of the Vinetropes tells the story of the birth of remarkable fairy-like creature who Sara discovers in her backyard. She is Lucinda Vinetrope, born wise, full grown and all alone, but possessing some astounding powers. In fact, the very blood circulating in her body is a form of clean energy Lucinda knows the world is different, not at all like she remembers it from her dreams in her growing chamber, but she is born and she must survive. The two protagonists, both lonely and bewildered by loss, instantly bond and begin a quest to see if other vinetropes do exist. Could Lucinda's birth herald the making of a Vinetrope Nation? But if so, it might also mean the return of their ancient, evil counterparts and put humans, vinetropes and all creatures of our earth in danger. With unique and life altering powers, vinetropes have the ability to shape the course of history for the better, but if the bad folk return as well, the future of mankind could be grim. Chocked full of fantastic characters, such as the comical squirrel brothers Ekle and Apkin, the elegant and courageous owl named Owletta, and Jamuna, Sara's human friend who has the gift of prophesy, book one takes the reader on a mystifying journey into an unpredictable future. Sherry L. Ross grew up in a home where writing and art were part of everyday life. She spent most days reading classic fantasy novels and writing poetry. Her first middle-grade novel, RETURN OF THE VINETROPES, is the fulfillment of a childhood dream. It combines her love of fantasy with poetry and prose. She has lectured on poetry and writing to middle school aged children. Ross is also the author of The Sorrell Ridge Cookbook and a book of poetry entitled Seeds of Pomegranate. In addition, she is the editor-in-chief of the Art Renewal Center, a non-profit foundation leading the revival of realism in the visual fine arts. Sherry Ross currently lives with her husband Fred Ross and their three cats in a house in the middle of the woods.